Over the years, we've tried dozens of water bottle holders - we finally found the perfect solution! * Tactical Rigid Nylon Webbing with copper snap button (no rust) that works with your 1.5" belt or backpack loops. Webbing will not deform in cold or hot temperature. * Perfect for walking, shopping, climbing, pets, etc. 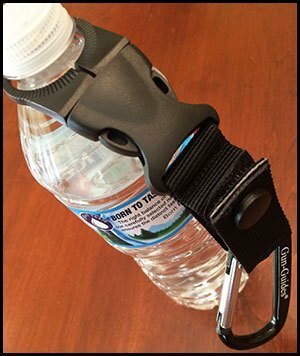 * Quick detach buckle and self-adjusting ring will accommodate most water (or "other") bottle necks. * Includes our NEW 3" G-G Carabiner for quickly clipping onto anything. * Water bottle not included.